WWE 2K16 brings back a delightful focus on the WWE’s “Attitude Era,” while also standing as a notable improvement over last year’s title in nearly every way. 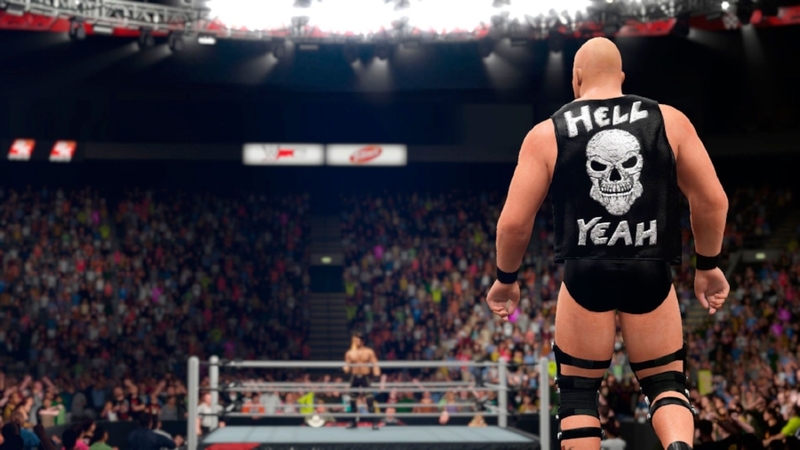 WWE 2K16 continues advancing the very solid graphical fidelity exhibited in the prior year’s game, while also giving the expected roster additions and mechanical tweaks that WWE gamers have come to expect. One of the things that made last year’s game clearly a new-gen affair was the emphasis it put on the visual look of the game. By bringing in studio Visual Concepts – those responsible for the eerie realism of the 2K NBA Series – the visual and audio fidelity of real arena experiences at WWE live events was replicated very effectively. With the visual element being the best part of last year’s game, it’s little-to-no surprise that this year’s effort is just as impressive. Unlike last year, though, there’s a greater emphasis on authenticity. Compared with previous WWE games that have depicted the bygone eras of pro wrestling, WWE 2K16 seems to have the most focus on replicating even the most minute details in differences between character attire and arena sets between events. When playing the 2K Showcase mode focusing on the career of Stone Cold, it’s common to unlock a wealth of period arenas along with even the most minimal costume differences that Austin and his various opponents had based on the specific event the campaign depicts. If you’re a wrestling fan with an eye for detail, then you’ll no doubt appreciate the effort that went into recreating the Attitude Era here. The same level of detail has also been applied to the modern roster, as well. Everyone is effectively represented, from current WWE World Heavyweight Champion Seth Rollins, to the Suplex Machine Brock Lesnar and Paige, the dominant force in the women’s division. Entrances and variations in music are also taken into account, with this game featuring an impressive variety of options with both pre-existing characters, as well as options for a created wrestler. 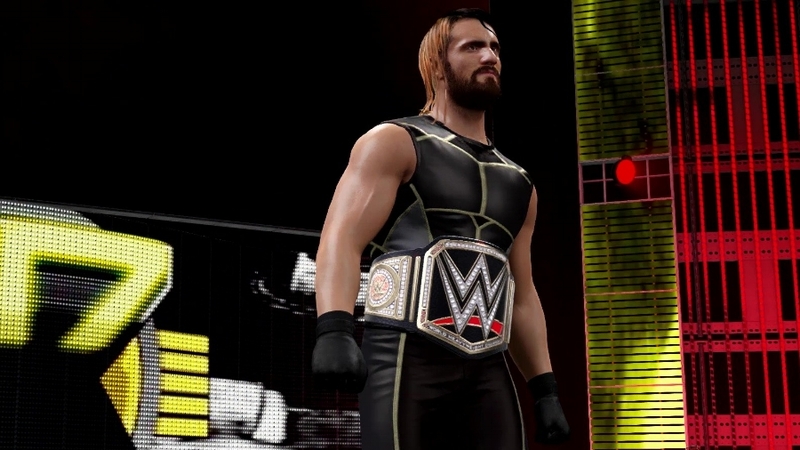 In short, WWE 2K16 has improved noticeably on the already strong visuals of last year’s effort. “Showcase Mode” returns as the centerpiece single player experience, but with a focus on the legendary career of Stone Cold Steve Austin in the 1990’s, it’s far more enthralling than the Showcase selection found in WWE 2K15. From a narrative and gameplay perspective, this mode is definitely the successor to the story sections of previous games. Playing each match gives you a certain set of eligibility requirements you have to complete in order to make it to the next one, and between a few matches you can see specially created video vignettes of actual footage of Austin’s rivalries from when they originally took place. The major difference between this year’s single player mode and last year’s is that this year’s has far more personality. By centering on Austin, the mode can prove to be either a walk down memory lane for a longtime fan, or an interesting introduction into what made the Attitude Era so compelling if you’re more familiar with the name “Roman Reigns” than you are with Dude Love. Alongside the solid representation of the “Attitude Era,” WWE 2K16 also brings the good in representing the organization of today. Current WWE World Heavyweight Champion Seth Rollins is one of the major players on the current roster. One of the major criticisms leveled at last year’s game was its new mechanical elements that severely hampered the pacing of matches you would play. It introduced a new “chain grappling” system, representing real starting moves like a basic collar-and-elbow tie-up giving way to a mini-game that can determine the early momentum of a contest. If the aggressor wins the mini-game, then they get to keep things going in their favor. If the receiver fills up the indicator first, they can then turn the tables on their aggressor and take the fight more directly to them to try and follow things up with more devastating maneuvers. This element returns in WWE 2K16, adding a bit more fluidity and a few more noticeable perks to succeeding. The biggest new addition to the gameplay elements, though, are the additions and refinements made to the reversal system. In wrestling games, the act of reversing a move is important, and can help turn the tide against an opponent by either dodging, or redirecting the force of one of your opponent’s moves back at them. In WWE 2K16, reversals are actually turned into a limited resource, forcing you to think a little bit more strategically about when exactly you use them, and how often you employ them. They regenerate over time, but it adds another layer of depth to the gameplay that wasn’t present before, and makes the game more competitive against human players in particular. Overall, it’s a welcome addition to the existing dynamic. After stumbling through some new gameplay additions that hampered the pace of play in the prior year’s title, WWE 2K16 rights the ship by adding a greater level of quickness and urgency to the pace of the in-ring element of the game. Another problem with last year’s game was the relatively low amount of match types that you could play in. While more variety has returned in WWE 2K16, it still has a way to go before it reaches the options we saw in WWE 2K14 and years prior. One area that WWE 2K16 far and away outdoes all of its predecessors, though, is in the size of the roster. There are over 120 wrestlers to choose from, ranging from stars of yesterday and today, as well as perhaps the future of WWE with the inclusion of up-and-comers in the NXT program. If you want to face '80’s and '90’s star Bam Bam Bigelow off against NXT’s Finn Balor, for instance, you can do it. The representation of the Attitude Era extends well beyond Stone Cold Steve Austin, with Mick Foley’s alter ego Dude Love recreated brilliantly within the engine of WWE 2K16. It’s an extremely solid and reverent experience to the WWE’s second major popularity boom. The next year’s game is likely already being worked on, but unlike last year, it doesn’t feel like we need to wait until next year to get a perfected and more satisfying experience. WWE 2K16 helps to set a very solid benchmark for where the series should continue to go on this new generation of consoles, and it doesn’t hurt to have the ability to go down memory lane and absorb some of the best moments of one of pro wrestling’s most popular eras. In short, WWE 2K16 is a great wrestling game, and if you’re at all interested in stepping through the ropes of the squared circle on an Xbox One or PS4, you can’t go wrong with this game.